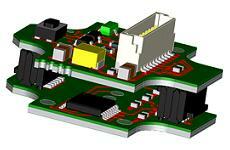 In NEXTRA Multi Board the user can design one schematic, which will be implemented on multiple boards. The different boards can have a different layer stack up or use different manufacturing technologies. A typical application for NEXTRA Multi Board is, when one PCB does not fit in the mechanical context and needs to be split into two or more pieces. In Nextra you can split the designs easily. The location of the connectors (female/male) on two connected boards can be defined and verified.